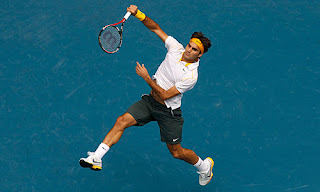 In a quarter final match of Australian open at Melbourne, both Roger Federer and Novak Djokovic beat their opponents in a one sided affair to set up a semi final berth. Roger Federer was at total ease when he was with his Swiss counterpart into play , as he beat Stanislas Wawrinka 6-1 ,6-3,6-3. Federer seemed as if he wanted to wrap things up, went on to take the first set within 30 minutes. "The scoreline suggests maybe it was easier than it looked like. I thought it was a pretty tough match," said Federer. Wawrinka , who came to Melbourne with an undefeated season with a Chennai Open Trophy in his kitty. He was to post a serious threat for Federer but it was not the case to be, who had earlier beaten Monfils and fiery server Andy Roddick to secure an all Swiss quarter finals. 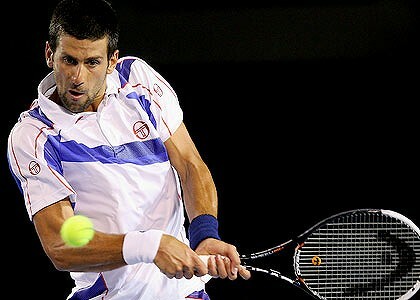 In the other match Novak Djokovic beat Wimbledon 2010 finalist Tomas Berdych with 6-1,7-6(7-5),6-1 in a straight sets victory. It was also a redemption for the Serbian as Berdych had beaten Djokovic in a semi final match back at Wimbledon.Djokovic, champion in Melbourne in 2008, came out with all his might, as he produced some awesome forehand, and extremely potent as his opponent struggled to get a foothold. Federer leads Djokovic 13-6 in head-to-heads and the Swiss has won the last three meetings between the two.However, Djokovic beat Federer in straight sets the last time they met at the Australian Open, in the semi-finals in 2008.